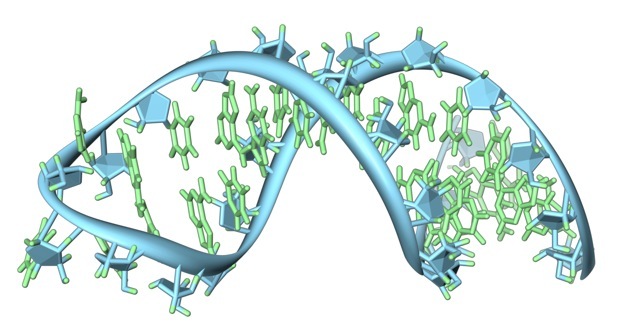 EteRNA, the new project from the brains behind FoldIt, wants to create and study RNA molecules to help cure diseases. Turn out if you give a gamer a chance, they can design RNA molecules far better than any computer. There are two ways to become a biochemical engineer. Study hard to earn your PhD, or play video games. The latter is thanks to Adrien Treuille and his collaborators, the radically innovative creators of FoldIt, a game to optimally configure hard-to-fold proteins that is already yielding groundbreaking results that we described last month. Treuille, a computer scientist at Carnegie Mellon, is now turning his attention to an even trickier problem: revealing the structure of genetic molecules known as RNA, which govern cellular processes and encode proteins. Understanding better how RNA works could unlock a host of potential cures for diseases, and gamers are Treuille’s central strategy to reaching this new understanding. EteRNA, a collaboration with Stanford University, demolishes the divide between computer science, genetic engineering, biology, and gaming. In the process, it creates something new and perhaps revolutionary: crowdsourcing the creation of scientific knowledge. Last week, we reported on how thousands of people on crowdsourcing platforms can cut monumental biology research tasks down to size (similar, efforts have been underway in astronomy for years with SETI@home and Galaxy Zoo among them). But EteRNA is something different. Gamers configure RNA molecules, rank the top molecules, and then the best are physically synthesized in the lab. The results are sent back for players to learn more about the properties of actual RNA, and strategies are shared online with tens of thousands of players who go back to work designing the next batch. They are getting better with each iteration. The process is allowing scientist to understand how RNA shapes behave in the world of real biology, and eventually could help engineer microorganisms or fight disease within our own cells. Peer review (that is by other gamers, not science journals) and open access learning are turning the slow difficult work of research into a lot less of both. Many minds make short work.